A week ago Sunday, The Boston Globe real estate section Address, featured as “Home of the Week” the Mauran House, an early house designed by Huygens and Tappe’ back in the mid-1970s. Well aware that I had skipped over this house in choosing the 50 projects for last year’s blog series, I had noticed while doing my blog research last year that it was for sale. The fact that it is still on the market now says something to me about how I had always felt about this house: that it is very well done, but it just never had the curb appeal that Rem’s houses typically had. According to Frank DiMella, the client said he didn’t want one of those “old fashioned hip roof houses.” He wanted something bold and modern. Left: Inspiration of garden wall across the street. Right: Arch in Prospect Park just down the street. “Elsewhere on the hill, red brick and brownstone are common building materials for numerous stately mansions. Thus the house became not a ‘house” but a garden structure, a vine covered arbor, a monument sitting in its little park. As for materials, red brick and brownstone colored precast concrete were chosen. 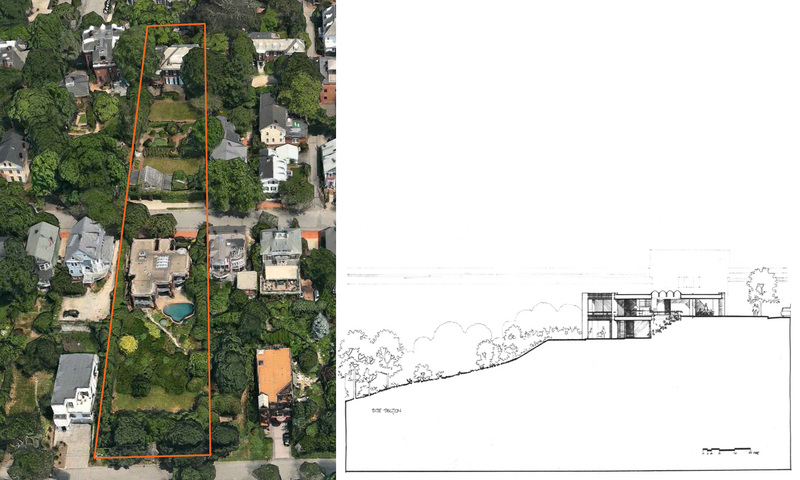 This aerial image from Apple Maps shows how the architects responded to the neighborhood context by recognizing that the garden wall and green house across the street is part of another through block lot uphill, and that the garden actually flows down from the house above and all the way through the lot at 110 Congdon Street. The garden is really two blocks deep with the green space flowing down the hill and the Mauran House is placed in the middle of it. It does not replicate its historic neighbors or become a jarring juxtaposition. To the street it is a garden wall of familiar materials, planted profusely and creating the mystery of what lies on the other side. Left: View showing through block gardens. Right: Site Section. As one is invited through the wall into the house, the view opens up and we are drawn to the light and view at the back of the house and realize that we are in the garden. A waterfall along the stair with plants and trees leads to the lower level garden. Inside and outside blurred together. What a nice way to live in New England. Left: Central garden hall. Right: Dining room view. From Rem’s writing, we know he was not a fan of flat roofs (White Planes, Big Roofs, Blue Water), but here he allowed himself the freedom to respond to his client and the context. 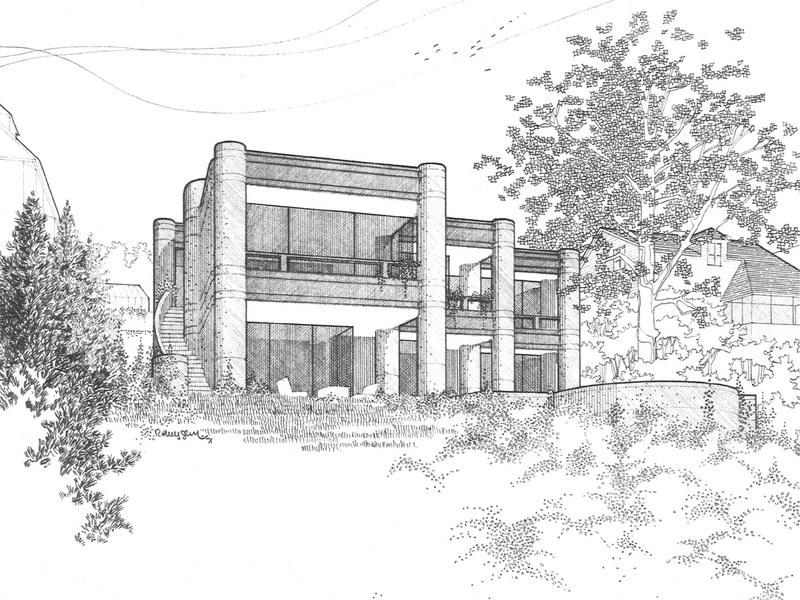 We see here the round columns that first appeared in the 1970 Bailey House, a key part of carrying out the idea. The non-directional shape was chosen so the columns could not become walls, but simply function as posts in the garden. Frank DiMella noted that Rem, as he often did, showed up at the office with the design completely worked out, the rhythmic grid of the plan dissolving from a garden wall to a transparent trellis of brick and steel. 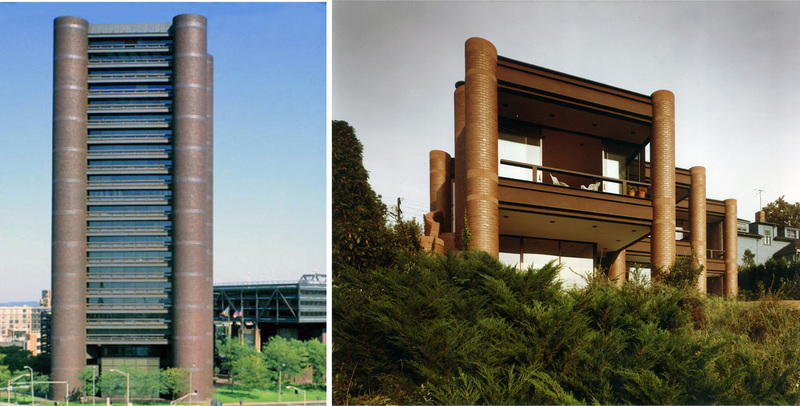 The specific expression drew inspiration from Kevin Roche’s 1967 Knights of Columbus Headquarters completed a few years prior in New Haven, CT. You can see Mr. Roche speak about his design here. Left: Knights of Columbus Headquarters, 1967. Photo courtesy of KRDJA Website. Right: Mauran House 1976. But that was not the only inspiration behind this design. As we have discussed before, Frank Lloyd Wright’s influence was never far under the surface in Rem’s work and here I see overtones of the Johnson Wax Building and Wingspread in the brick color and stone trim. 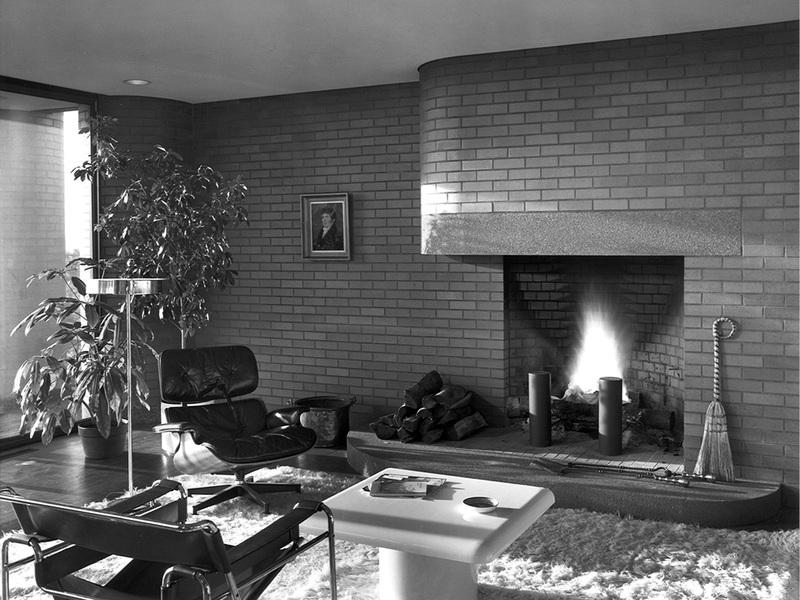 The fireplace to me is certainly derivative of Wrightian concepts. The andirons as cylinders relate directly to the columns, reflecting Wright’s principle that the details should relate to the whole. Fireplace with original andirons and furnishings. The circular pool depicted in the drawing above is similar to many of Wright’s drawings where water is flowing over the edge of a circular pool. We can only imagine if the infinity edge pool technology had been available in 1974 that the concept would have been implemented here. So now that we understand the concept of the house, let us return to the marketing of the house for sale. It might be easier to find a king for this so called “contemporary castle” than to find a non-architect who can accept Brutalism as a descriptor for their house. Doesn’t “Live in your Garden” sound more compelling? The house is really the absence of a house. It is conceived of garden walls, which are solid to the street and perpendicular to the amazing view. It has a waterfall and an atrium along with several skylights to enhance the feeling of being outside even in a climate that doesn’t lend itself to the practice in some seasons. With a $2.8 million dollar sale price the new owner might not be doing his own gardening, but the idea of living with nature and having incredible views would seem to me to attract a larger pool of potential people who could imagine living in the house. Houses like this need to find a special buyer, but if you are fishing for Brutalism fans or kings, you might just miss the gardeners. Misunderstood Modernism. Well said. You should share the commission!